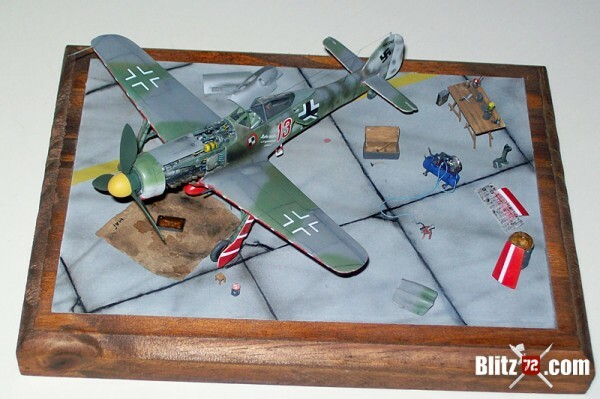 Check how some scratch built details and a clever scene can turn Academy’s FW-190 into a petite red bellied masterpiece! Model and photos by Sergio Bellomo from Argentina! In the final months of WW2, the Me-262s Jet Fighters were slowly taking over as the most advanced aircraft operated by the Luftwaffe. However, this still needed traditional propeller driven fighters to protect it, specially during the rather long landing and takeoff legs were it was most vulnerable. 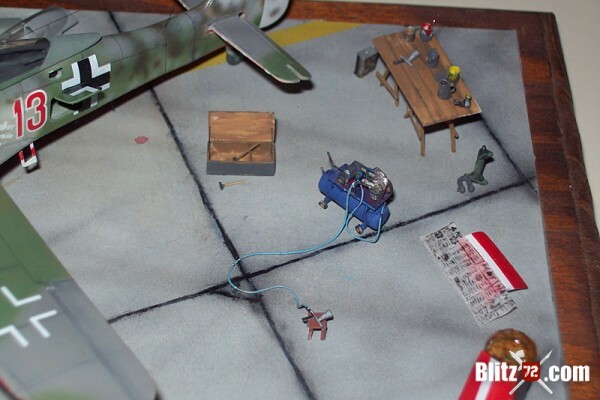 It didn’t take long for the allies to discover this, sometimes setting ambushes on the known paths where the Me-262s left the outer ring of their own airbases triple A fire. As such, the elite group JV-44 commander, Adolf Galland, created a special FW-190D unit with the sole mission to protect his 262s while approaching and leaving the airfield. The Platzschutzstaffel (airfield protection squadron) was based in Ainring in the south of Germany, and was led by Staffelkapitän Heinz Sachsenberg. Heinz, an ace with proven experience, was known for saying “Don’t trust anything without at least a propeller on it” when asked why he wouldn’t fly the 262 Jet Fighters. 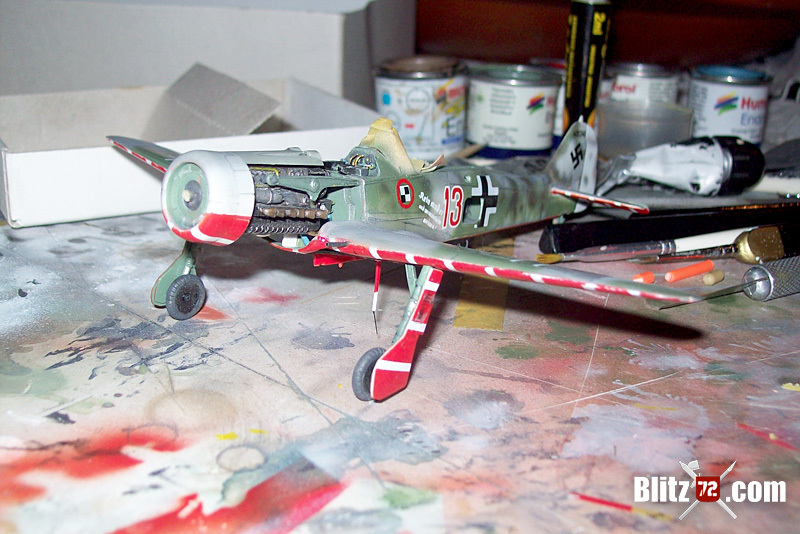 To avoid the ever present danger of being shot down by their own Anti-Aircraft Artillery, the Fw190 D9s and D11s from this small unit had their bellies painted in a flamboyant red with white stripes scheme. This won the unit the nickname of “Papagei Staffel” (Parrot squadron) or “Galland-Zircus”, although some sources claim these names were given post war. 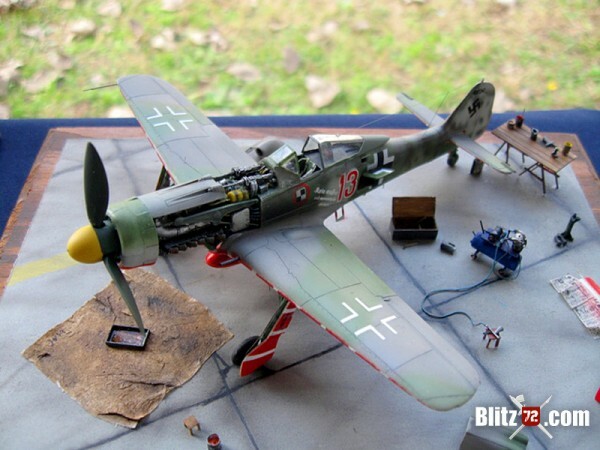 Among the airplanes of this units there was a FW190 D9 coded “Red 13”, the personal plane of Obt. Klaus Faber. Probably the most colourful anecdote of this pilot and “Red 13” is his claim of shooting down 1 (some sources says 2) P-47D Thunderbolts on May the 3rd. He was flying a “courier” mission while taking the oportunity to visit his girlfriend, and had a bottle of Champagne on board when he found the American fighters returning from a sortie and jumped at them. Turning 1/72 Academy’s Dora into a super detailed masterpiece. 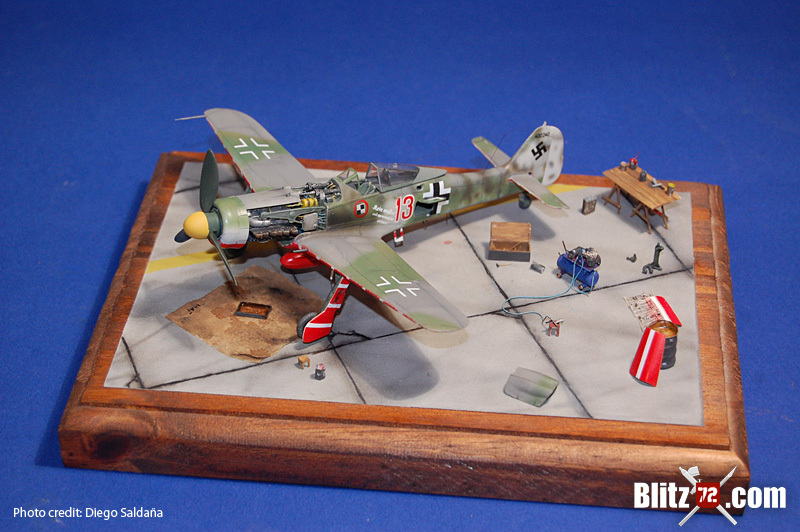 This is Academy’s well known 1/72 Focke-Wulf FW 190 D9 kit, or at least it was when the build started. Sergio modified a lot of it and also added some details to make this a Dora worthy of the name. For instance, the engine is a 1/72 Jumo 213 from Aires, however the wiring and the engine mount were all scratchbuilt. All the rudder and elevator moving surfaces were removed and repositioned for a more natural look. The canopy on Academy’s Focke-Wulfs is one of the main drawbacks of the kit. It is clear and its shape is OK, but on the inside it has two “tabs” at both sides that goes from “behind” the canopy rail and up into the transparent area. For that reason it was replaced with a homemade vacuformed canopy. 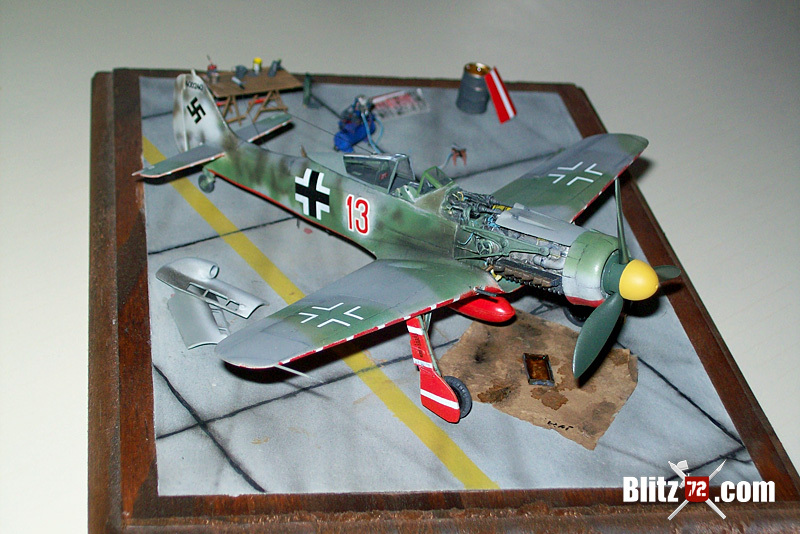 After the model was painted, decaled and weathered, Sergio placed it in a base that really brings the model to life. 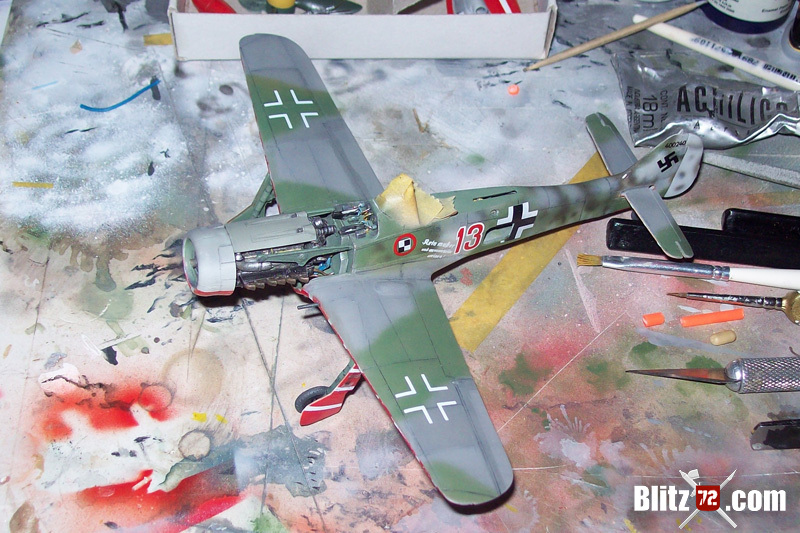 With a load of scratchbuilt details, including a compressor, tools, oil collecting pan under the plane, and even the newspaper masking the area in one of the nose parts, it is a feast for the eyes. Sergio said he wanted to display a paint shop scene, as the Focke-Wulf was having some of the lower panels refinishing, which would place this scene in the late April, early May timeframe. This is another example of how a regular kit can be turned into a true masterpiece with some patience and good old scratch building skills. Congratulations to Mr. Sergio Bellomo for a job well done, and thanks for sharing such an inspiring model with Us. 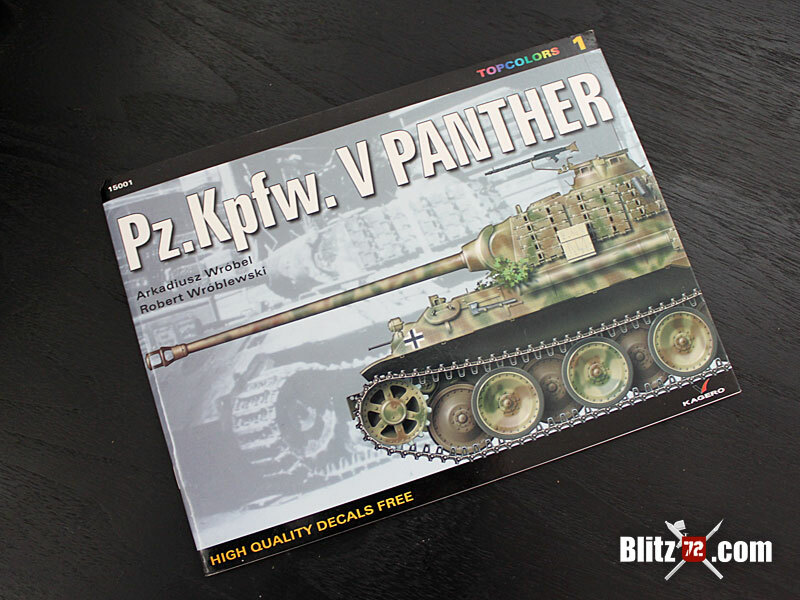 I promise I will bug him to have more of his stuff featured in Blitz72.com, as I have seen some deservedly awarded in the last IPMS Mar Del Plata Contest! this is a magnificent build. 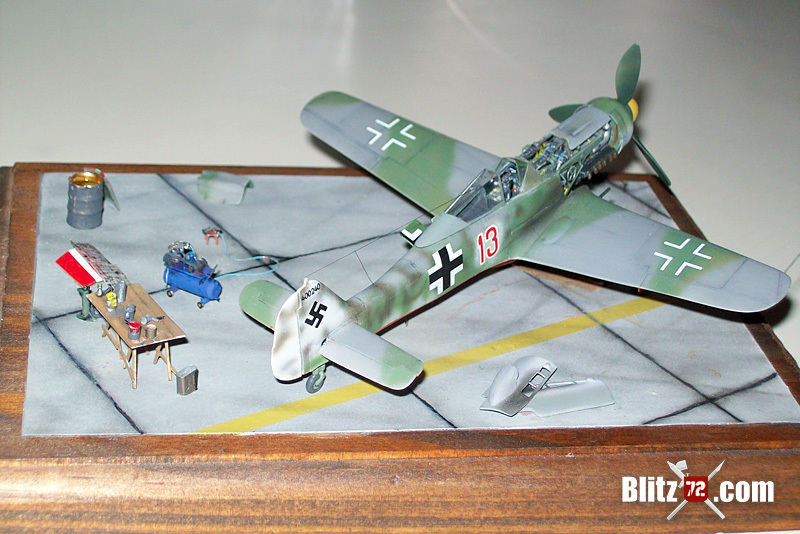 Sergio did an exemplary job in 1/72nd. This work is often seen in 1/48th and “larger”. Well done Maestro!